In little over a week from now, Samsung will officially announce the Galaxy S10 series. 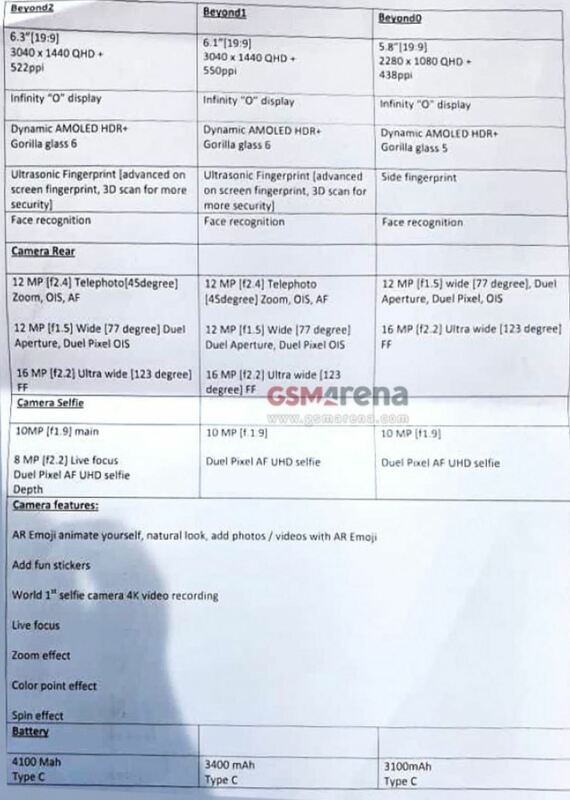 However, GSMArena has shared official spec sheets for the Samsung Galaxy S10e, S10 and S10+. 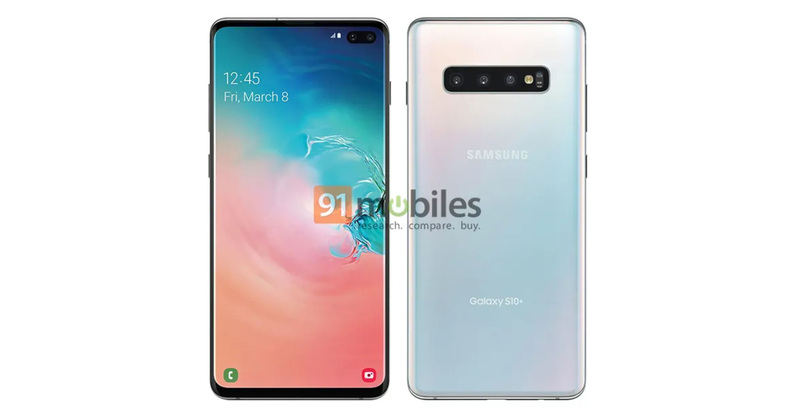 The Galaxy S10+ features a 6.3-inch display with 19:9 aspect ratio, 3,040 x 1,440 QHD+ pixel resolution, Gorilla Glass 6 protection, Dynamic AMOLED HDR+ and facial recognition. Camera-wise, the phone sports a triple rear-facing camera array that is comprised of a 12-megapixel sensor with an f/2.4 aperture telephoto lens, a 12-megapixel sensor with an f/1.5 aperture wide-angle lens and a 16-megapixel ultra-wide camera with an f/2.2 aperture lens. Both the 12-megapixel cameras include optical image stabilization (OIS). Selfie-wise, the S10+ sports a 10-megapixel main camera with an f/1.9 aperture and an 8-megapixel sensor with an f/2.2 aperture. The selfie cameras support 4K video recording. A 4,100mAh battery powers the S10+, though there’s no mention of reverse wireless charging. The S10+ also sports HDR 10+ playback, Dolby Atmos sound, a display that can achieve 800 nits of brightness and a region-dependent Exynos 9820 chipset. The S10+ comes in three configurations: 6GB RAM/128GB ROM, 8GB RAM/512GB ROM and 12GB RAM/1TB ROM. 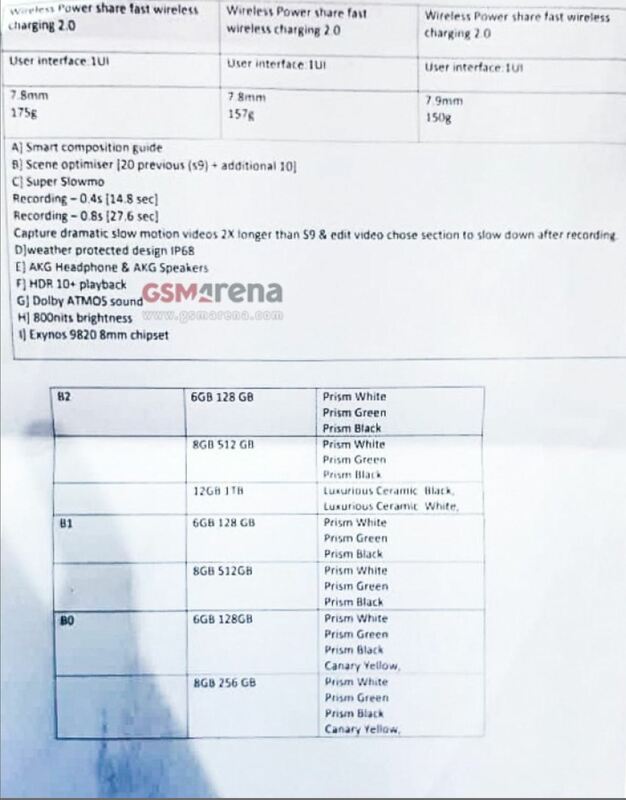 The 6GB and 8GB of RAM variants will come in ‘Prism White,’ ‘Prism Black,’ and ‘Prism Green’ colour options. The 12GB variant, meanwhile, will be available in ‘Luxurious Ceramic Black’ and ‘Luxurious Ceramic White’ colour variants. The standard S10 sports a 6.1-inch display with 3,040 x 1,440 QHD+ display and an in-display fingerprint scanner. It also features face recognition and the same triple rear-facing camera setup as the S10+. Instead of a dual front-facing camera array, the standard S10 will sport a single selfie camera. The S10 also includes a 3,400mAh battery. Additionally, the S10 features HDR 10+, Dolby Atmos and a region dependent Exynos 9820 processor. Samsung will not offer the S10 in a 12GB RAM/1TB ROM configuration. Last but not least, there’s the S10e. The S10e only features a 5.8-inch display with a 19:9 aspect ratio and a 2,280 x 1,080-pixel resolution. This phone sports a side-facing fingerprint scanner, and drops the the S10 and S10+ telephoto lens for a dual camera array. Similar to the standard S10, the phone only features a 10-megapixel front-facing camera. Battery-wise, the handset sports a 3,100mAh battery, HDR10+ playback and Dolby Atmos sound. Samsung won’t sell a 12GB RAM/1TB ROM variant of the smartphone. It will, however, offer a ‘Canary Yellow’ colour variant of the device. All three of the handsets feature Samsung’s One UI and an Infinity O-display. Even though we now know about the S10 specs, it’s still unclear which handsets or variants will come to Canada, as well as how much these devices will cost.